Has Trevor LOST his imagination? 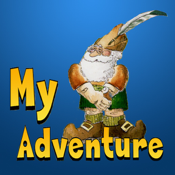 "My Adventure" is an interactive ebook. * Tap the words to have them read aloud with each word highlighted. * Explore the pages to hear what sounds the animals and other things make. * Other pages have animation such as the Dad and boys sliding down a waterfall, or the flying car cruising over the city. Trevor started crying one night because he had lost his imagination. His Dad comforted him and invited him to go on a big hike the next morning early. On the hike he learns that he has lots of imagination left and even meets a new friend he can hardly believe is real.